Winn (1868-1933) was a turn-of-the-century writer, journalist, violinist, and pedagogue. She had a lot of opinions, and she took great joy in sharing them. Her books include Violin Talks (1905), How To Prepare For Kreutzer (1910), How To Study Fiorillo (1910), and The Etudes of Life (1908). (Most, if not all, are available on Google Books. Just look up her name.) I just stumbled upon them yesterday by accident. Winn sidetracked me with her authoritative voice, and ever since I've been reading her highly entertaining work in my spare time. I know relatively little about her besides what she reveals in the books. She apparently studied in Europe (as almost all serious musicians did in those days) - once had a nervous breakdown after practicing too hard for too long - taught in public schools and colleges - lived in Boston - studied with Julius Eichberg, a Boston-based teacher who taught many great female violinists - edited music - and had "unfortunate fingers", in particular an obnoxiously short fourth finger (just like me!). She sounds like a very interesting, strong-willed lady, and even when I oh-my-gosh totally absolutely 100% disagree with her, I still find I Can't Stop Reading Her. Children's work in America has been as yet an experiment and is not based on psychological and pedagogical training such as teachers in the public schools are obliged to receive before they are entrusted with the education of the young. The theory that "any teacher is good enough for a beginner" is fast becoming null and void. There must be teachers trained for children's work. They most love this preparatory work. They must be willing to serve art from the beginning of child training. Such teachers are born and not made, and yet their preparation for teaching must be broad. They must know violin literature; they must love children and be able to meet the child on his own plane; they must be unselfish, consecrated, thorough. Above all, they must be able to produce a beautiful tone, - the first model which a child hears. The teacher should possess a winning personality. The child should be obedient, respectful, prompt, and willing. The German child always comes to his teacher with a "good morning" and a hand-shake, but he stands somewhat in awe of his master. Teacher and pupil can be sympathetic without seriously interfering with the dignity of their relation. The nervous and highung child suffers under severe teaching. Few pupils know how to practice, hence the prevailing fault of neglected rhythm. Said a well-known teacher: "Never let anything pass which is not up to the standard of true musicianship. It is better to play twelve Etudes in one year, and play them well, than to go over the whole range of Kreutzer and Fiorillo. You will have it all to do over again some day, and it will be hard indeed to undo what you have done unwisely or carelessly." "Rag-time" music is the very enemy of careful reading, attention to rhythm, and the cultivation of the highest in music. It develops inexcusable laziness in pupils, and the teacher has to undo a host of faults which could be avoided if parents only knew them to be positively the result of the "rag-time craze," and would forbid it. This would save hard work on the teacher's part, and much sorrow on the part of the pupil. I don't know why it is, but violinists are very often quite sensitively organized and delicate. One or two hours of daily practice is the most the beginner should undertake. I regret a year of hard work at six hours a day of practice. I paid for it by a nervous collapse. I have often said that pupils should devote from fifteen to thirty minutes daily to scale practice; then they are not hampered by technic, as in Etude work, and, because the mind is concentrated one one thing, there is no excuse for faulty position. The prevailing "bad point" of new pupils is that the left elbow is not well under the right side of the violin, thus compelling the hand to tilt to the left, the thumb to cling too closely to the neck of the violin, and the whole arm to be changing its position constantly. There can be no progress with such a position, for intonation will never be correct, and technic, as well as a command of positions, is out of the question. Teachers who neglect these points do so at the risk of their own musical reputation. There are many methods of holding the bow, but there is only one way of holding the violin - and that is the right way, - free and beautiful. The violin is a difficult instrument indeed, but the drudgery of teaching lies in certain almost necessary repetitions. I find myself saying certain things daily. One is, "Do not allow the left elbow to remain far to the left of the violin." Another is, "Keep the fingers down as long as possible." Still another is, "Do not cling to the violin with the thumb." So what do you think? Anything in there that leaps out at you as being incredibly relevant? Incredibly irrelevant? Good advice, bad advice, advice you can't make heads or tails of? Winn's books have made me wonder, what will teaching be like a hundred years from now? What conventions of today that we take for granted will tomorrow's students laugh at? Which of Winn's ideas are due for a come-back (personally, I love the ideas of mandatory ear-training and viola-playing)? Mandatory viola playing... love it! The viola recommendation does make sense. I think most of her advice is relevant to today. Thanks for sharing your discovery of this violinist. This is great. I am going to read it again in the morning with my violin and see how I'm doing. I absolutely love how sure she is of her own opinions! What fun to read, and how do you come across this stuff? You always come up with the most interesting topics, Emily. Does your list include a Jenny Claus? 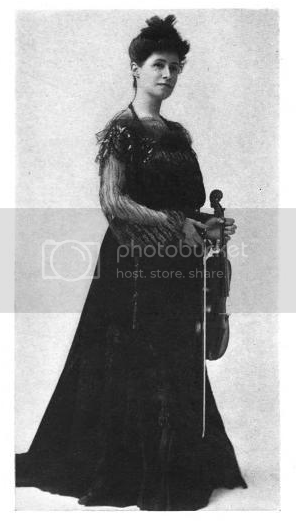 She appears to have been the first female professional violinist to have toured Japan - as early as 1875 (see my latest blog). A Google search produced a couple of reviews in Australian newspapers, rather condescending they were, I thought. But that's about all I dug up. I suspect quite a few women disappeared from the stage once they married, when they would also have changed their names. Of course, if the women were writers as well as violinists, that helps! Although some of the material looks dated, that's mostly a reflection of the time in which it was written. (That admonition against rag-time music is particularly amusing.) But there are a lot of good points; my teacher is echoing the words about the left elbow, for instance. And if the advice about violas was taken today, it would be easier to get a string quartet together. Margaret, I haven't heard of her, thanks for the tip. And yes, lots of women disappeared. Which is unfortunate, but... It was a different era, and much more difficult to choose between having a family and having a career.